Time for a new monthly theme for the regular postcard swap at UKStampers. I didn't manage to play in September so I was determined to get to it this month even though the theme is a tough one for me! As ever, cards are to be posted "naked" and must include stamping. The theme is "spooky" and for me it's a tough one because I don't have any Halloween stamps or anything vaguely scary! I managed last year with some digi elements combined with some "filler" stamps and this year decided to see if I could take it a step further and just use colour and composition to set a spooky mood with otherwise non-spooky stamps. I got some new stamps at the weekend so I set about giving "Molly" a ghostly makeover. 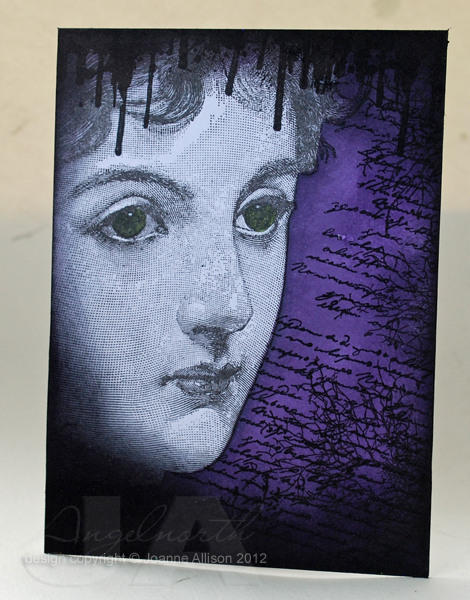 She's stamped and masked so she kept a ghostly pallor while the rest of the card got sponged with purple and black inks. I concentrated black at bottom left so Molly's head is looming out of the dark. I added some scripty writing and bare branches (which actually made me think of capilliaries or nerves once I'd stamped them!) and then stamped selected bits of a drippy frame stamp along the top. A tiny bit of Copic colouring finished it off (green for her eyes and some grey shadow down the side of her face). Proof that you don't need hallween stamps to make halloween cards. The drips are the perfect finishing touch. Ooh Joanne this is a fabulous card, you have captured the mood perfectly. What a gorgeous stamp to have in your collection. I love this card - it has a real gothic feel to it without any overt halloween stamps. 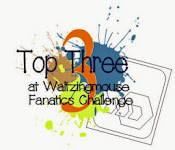 Thanks for your comment on my blog - it made me smile. I've used that stamp such a lot. Do let me know next time you have a clearout! Beautiful! I love the haunted feel to this. Thanks for the inspiration! Fabulous, I think you've hit it perfectly using the purple!! That is a wonderful postcard Joanne and great use of those background stamps too. Love the look of 'Molly's' ghostly pallor looming out of the gothic background and the 'drips' down her head give a real spooky feel to this wonderful postcard. I loved this when I saw it on the forum and I love it more now!It has so much atmosphere!